The McKernon Group has invested in a lakehouse-sale property where we have replaced an old lake-house with a cottage style home on one of Vermont’s beautiful Lake Bomoseen. We have also done extensive renovation of the boathouse which has great charm and added living space. $825,000. If owning a house on one of Vermont’s prettiest lakes has been your dream, then you will be interested in this newly built cottage-style home built by The McKernon Group, now available for sale. Located on Lake Bomoseen, the 2000 sq ft Lakehouse-sale sits on approximately ¾ of an acre with a 1000 sq ft basement. With it comes a charming 2-story boathouse with docks, built on 135 foot of lake frontage. The boathouse has 1200 sq ft of living space. There are decks on both floors of the Lakehouse-sale. 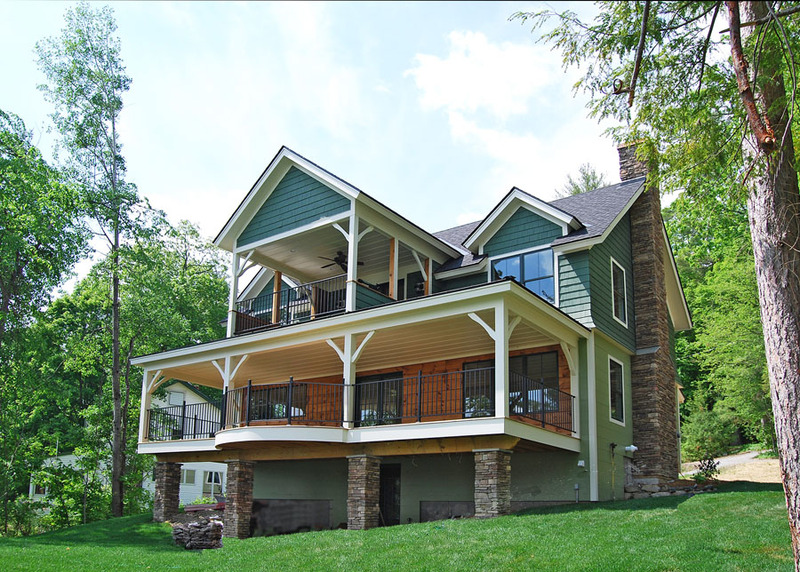 The first floor deck is 12×38 with amazing views of the lake. The second floor deck is fully screened, 14×14. There is an open floor plan on the first floor; kitchen has painted cabinets with stone top counters; gas fireplace LR area; half bath. The second floor has 3 bedrooms and 2 full baths. The house has a new well and septic system and 200 amp electrical service. (No hassles trying to upgrade!) It has a heat recovery and ventilation system (HRV). The walkout full basement is designed to include laundry and full bath and has the potential of finished living space. The boathouse is unique in that you can no longer build this kind of a structure in the water today. When you are in the boathouse you are surrounded by water. It is newly renovated with room to put a small boat under the two-story structure. The foundation has a Gunite concrete encasement and a waterfront deck area is perfect for sitting and relaxing. The upper part of the enclosed boathouse is all….. open space. There are several windows for breathtaking views, and a cupola to let in additional light and ventilation. The property has access to the Point of Pines common beach area. This great house is fully furnished and ready for occupancy. Give us a call right away if you are interested.